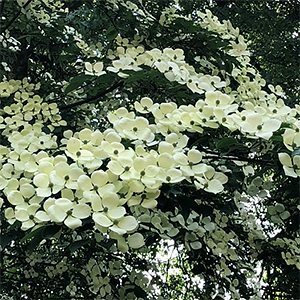 With very attractive creamy white flowers Cornus Norman Hadden is a semi deciduous dogwood tree. Very easy care and a good feature tree. This is a semi deciduous dogwood tree, and with showy creamy white flowers covering gate tree in early summer, Cornus Norman Hadden makes a great feature tree. This is a cross between Cornus louisa and Cornus capitata, it will lose some foliage in winter however holds on to most. In autumn the foliage will change colour, more dramatically in colder claimed where it will turn to a mid red. As the flowers age they turn to a pink, the flowers are followed by pink strawberry coloured fruits. Foliage is a mid green. Over time this reasonably fast growing tree will reach around 5 metres in height with a similar spread. It grows well in a humus rich moist yet well drained soil and will cope with part shade to full sun. We find that the flowers show lasts longer where the tree is protected form the hot afternoon sun, especially in warmer climates. First grown in the UK by the plantsman Norman Hadden in Somerset. Flowering Time – Early summer. Foliage – Mid green semi deciduous.